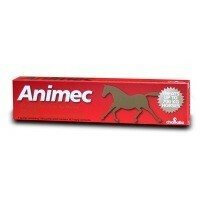 Animec Horse Wormer is an oral paste for treatment in horses of nematode or anthropod infections due to a range of internal parasites, including Large strongyles, Small strongyles, Ascarids, Pinworms, Neck threadworms and stomach bots. Each syringe contains 7.49g paste which contains 18.7mg/g ivermectin and treats horses up to 700kg. Très bon produit , très bon rapport qualité prix .